It originated at the Morden Research Station, Agriculture Canada, by C. R. Ure for the Prairie Fruit Breeding Cooperative, selected as #6021, tested as PF36, and released in 1986. The tree is moderately vigorous, upright spreading, with fair to good branching habit and is annually productive. It is hardy to zone 2a and moderately resistant to fire blight. The fruit is medium size, 6-7 cm (2.5") in diameter and round-oblate (flat round) in shape with unequal ribbing, and matures in midseason from early to mid September. The skin is moderately thick, with a light green base, striped and blushed with bright to dark red, occasionally completely red. The flesh is greenish, crisp and moderately acid. It is very good for fresh eating, good for cooking, makes excellent juice, and stores well for 16-20 weeks. 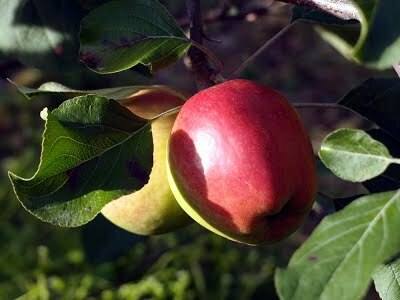 Note: Green-fleshed apples may have a slight bitter taste to some individuals. Both our trees will fruit in this, their 4th year. Neither have shown any die back so far.